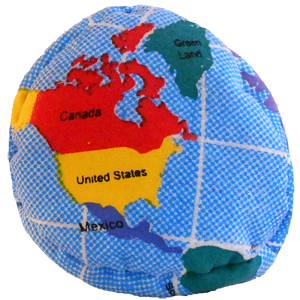 This offering is our first attempt at making the new Globe Dirtbag Footbag. This one has a four color silkscreen faithfully representing the earth as a whole. This one is a simple four panel design and we eventually settled on making them in a twelve panel design. That translates into a great savings for you. While they last, this one is on sale for the very low price of $4.00 per unit.